It's February, and the weather is pretty miserable. There are cold fronts, snow storms, dense fog, and freezing rain blanketing various parts of the country. Fortunately, I've got just the pick-me-up for you: blood oranges. From their blushed rind to their scarlet flesh to their tangy flavor, blood oranges are among the most dazzling of citrus fruits. Since their season runs from December to April, they're also at their peak right now. So grab your scarves, rain boats, and winter coats, and get to the market today to purchase some blood oranges. Though there are three types sold in the U.S. -- moro, tarocco, and sanguinello -- you'll likely find moros in your supermarket since they're the most common blood oranges sold here. Moros have a bright orange rind with a rose blush and deep crimson flesh. When you pierce into the flesh, you will see instantly why they're called blood, or sanguine, oranges. Anthocyanin, the same chemical that makes blueberries blue, gives the flesh their characteristic bloody color, which can range from pale scarlet to deep magenta, depending on the variety and stage of maturation. They're also packed with health-promoting antioxidants, vitamin C, fiber, and potassium, so they may even help ward off a February cold. If you've never had a blood orange, then expect to be wowed. Like their appearance, their flavor is singular: the initial bite tastes like a subtly sweet orange infused with tangy red grapefruit; then slowly and deliciously, you experience, hints of sparkling cherries and sweet-tart raspberries. Though blood oranges are grown in Mediterranean climates such as Italy, Spain, and California, you can savor them no matter where you live. With their rising popularity over the past several years, they are being sold in most U.S. organic markets and general supermarkets and can even be ordered online. So treat yourself this February to some fresh blood oranges. Who knows, you may just forget all about those 5 inches of snow that need to be shoveled off of the driveway. Seafood and citrus wed beautifully. This vibrant and tangy blood orange and mango salsa brings out the best in pan-seared tilapia or any of several types of seafood, including halibut, cod, or shrimp. Using a sharp knife, peel the blood oranges, removing all bitter white pith. Working over a small bowl, cut between membranes to release sections. Add mango, green onions, orange zest, ginger, lime juice, jalapeño, herbs, and salt. I suggest adding the diced avocado just prior to serving the salsa to prevent it from being stained red by the blood oranges. Heat olive oil in a large skillet over medium-high heat. Season both sides of fish with salt and pepper. Add fish to the pan; sauté until lightly browned and crisp on the outside and opaque on the inside, about 4-5 minutes per side. Place fish on a plate and top with a spoonful of salsa. Garnish with additional fresh herbs, if desired, and serve immediately. Serving suggestion: Serve tilapia over a bed of whole wheat couscous with a side of steamed snow peas dressed with lemon juice and a splash of soy sauce. Want to learn more about the history of blood oranges and how to cook with them? Then check out my latest NPR Kitchen Window article, "Blood Oranges: Change You Can Believe In." There you will find the following four recipes: Blood Orange and Mango Breakfast Parfaits, Wild Arugula, Blood Orange, and Prosciutto Salad, Mahi-Mahi with Blood Orange and Avocado Salsa, and Blood Orange Compote. Also if you're looking for more healthy recipes, then check out GoHealthyGoFit, a great web site devoted to healthy living. Andrew, who runs the site, recently asked me to contribute a couple of healthy recipes, which you can check out here. What a beautiful dish! So healthy, colorful and tasty looking! Great! Hey torturer, I've grabbed my scarves, rain boats,winter coats AND a flipping pair of wings, & shall try & get across ASAP! That does look like a great tilapia. Very fresh & colourful! Looks delicious. I haven't seen them in market (nor meyer lemon) and I live in FL...you'd think...! Anyway I have been experiment with pumelos which sound like they have a similar taste. I have to remove a plum tree that's come to the end of its life cycle and have been pondering what to plant in its place. Your post sure makes a good argument for blood oranges. 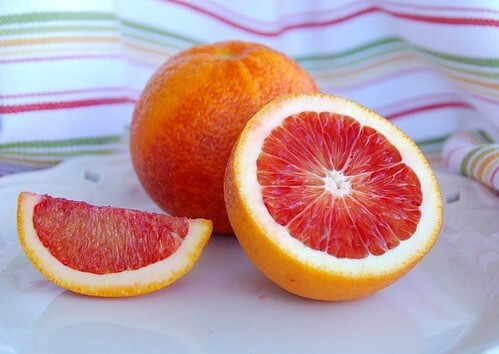 That is a GORGEOUS photo of the blood orange! And the dish looks phenomenal. Vibrant and delicious. Exactly what I needed to get me out of my winter doldrums! I've been in a soup/stew rut -- thanks for reminding me that you can (and should!) be eating beautiful and colorful food even if it is the dead of winter. Oh man, give me some!! Just looking at the fresh oranges and pictures of the refreshing (and delicious looking) Tilapia makes me feel a little warmer on a snowy and dreary Seattle day! That looks so lovely! Now where to find some blood oranges around here! What a great way to eat colorful foods. Tilapia is a good fish to pair with those flavors! That's a beautiful dish - I can almost taste it now. I love mango in salsa and the blood oranges would seem to be perfect with them! They're gorgeous. And I know it's mid-winter when I start craving citrus. Although it's been 60-70 degrees in the Triad this week. Cash and I sat on the front porch together today. IN FEBRUARY. Weird. These look perfect. I love me the Blood Oranges too! Honestly, this is EXACTLY my kind of dish. Love tilapia, and love fruit salsas on top of it. This is on my to make list. Perfect girlie luncheon food, too! Blood oranges are a rare treat in the markets here. I love using them for blood orange curd, and also in tarts. Blood oranges are indeed a cure for winter blues, and your tilapia recipe showcases them beautifully. What a colorful healthy dish! I love blood oranges in both sweet and savory dishes. Great fish paring. The oranges look delicious. What a great tilapia recipe. Love the flavors it incorporates. That just looks so fresh and yummy! mmmm. there's not much i love more than blood oranges. i squeeze it freshly when it's in season and freeze it so i can have it all the time. so good! thanks for the great info about blood oranges. I've always thought there was only one variety. That phot looks like a quick trip to the islands...all sun and bright flavors. Thanks! Cheers up the rainy evening. What a fresh and delightful photo! Looks like spring is around the corner. From the looks of your photo anyway, not from looking outside at the weather! Love the idea of the citrus mango salsa. Beautiful! This is beautiful... I love tilapias... we have a lake on the farm that has them. Looks fantastic Susan - as always! I agree, fish and citrus are the perfect combo. I love blood oranges, lovely and sweet. I haven't eaten blood oranges since childhood and thank you for reminding me just how good they are Susan! Beautiful photos and this would be a perfect meal for me anytime! Beautiful picture! I read about your blog through an interview in the College Hill Independent. It just so happens that our dining hall has been serving blood oranges of late--I've laid in a small supply. I hope my store will have them in stock this week. I am so seriously addicted to these it isn't funny. I've made jelly, marmalade, granita, salads, spiced compote...and probably eaten more in the middle of the night than I care to admit. I just topped a chocolate cake with honeyed blood oranges today. They're rather expensive (at least in the Midwest) but they retain their colour so beautifully when canned, it *almost* justifies the cost. I tried reasoning that fifty dollars worth of oranges is a small price to pay for not getting scurvy, but I don't think my husband is convinced. By the way-we had your pea and saffron pasta last weekend and the whole family is worshiping your genius.The wee one declared it the best food he's ever eaten. That's gorgeous! I've been craving citrus and fruit for a while now, very nice indeed! I have a blood orange in my fridge right now! That dish looks delicious! just the color of blood oranges makes me think spring/summer. they are the best. not to mention this dish looks like spring on a plate! Oh, you are so lucky that blood oranges are freely available in supermarkets... here in London (just across the channel from where they bloody grow!) they are speciality items at expensive markets only :( I always gorge on them if I am in Europe at the right time... This recipe looks wonderfully simple - I love fruity salsas with fish. Your plate is particularly inviting. 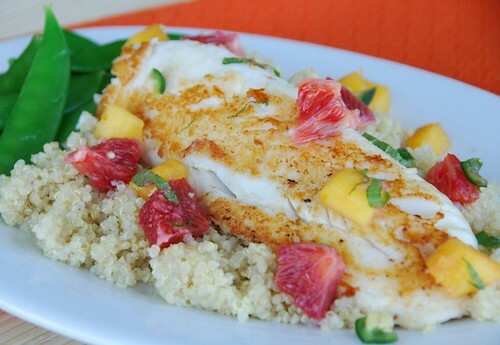 That Tilapia with Zesty Blood Orange and Mango Salsa sure sounds good. One of my favorite things to do with left over Tilapia is to make some fish tacos and wash it down with a cerveza! Taco Fish La Paz in Guadalajara, Mexico has a stand on Avenida La Paz in Guadalajara sounds like ‘Taco Nirvana’. My experience in Mexico is that some of the best places to eat are those that are off the beaten path that the locals frequent. I’ve been looking for good places to eat in Guadalajara and Taco Fish La Paz in Guadalajara sounds like just the place. Fortunately, I live in Ajijic, Jalisco so the trip is a short one. A must try! beautiful blog. I have to learn much more abot bloggin. Su-u-usan, where are you? 10 days and no new post? What's up? I love blood oranges. Nice dish. I used them for a sauce for ahi tuna on my blog. I love fish and citrus together. This looks wonderful! michelle-Yum for the black beans idea! snooky-It's a nice change, indeed. joan-Have you tried Trader Joe's? susan-Now, that's a delicious idea! chris-Yay! I'm glad to hear it. cakespy-It's a lively meal for a dreary day. alisa-Try Trader Joe's if you have one. abby-It can be like that in NC. Enjoy! lydia-Mmm... blood orange tarts are divine. jv-Welcome! I'm glad you found me. mark-Tilapia is one my favorites too. heather-I feel the same way. elle-That's a sweet thing to say. melissa-How kind of you. Thanks! rosie-Ooh, go get some! Quick! mike-They are fun to cook with, aren't they? cakelaw-Oh, tilapia is delicious. I hope you try it. melody-I'll keep my fingers crossed. goody-I wanna live at your house. ;) I think I like your wee one. :) How sweet of him and of you to let me know. Thanks. ash-I hope you try it, then! joe-Welcome Joe! And thanks for the comment. lacocina-Welcome! Thank you so muhc. eric-I like them on tuna as well.